Here's our next giveaway. It's a rather unique item from an Etsy shop. Consider the giveaway description as written by Visionary Bri. Do please let me know if you like these more unique items being offered. It is definitely different than the more typical gadget or cash/gift card. Good luck. Visionary Bri is at it, again, with another one-of-a-kind promotion. Enter the Desert Rogue Giveaway. 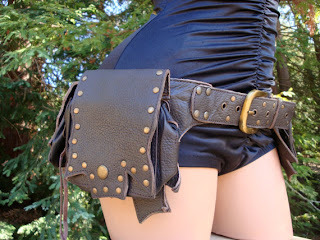 The Etsy shop, Desert Rogue Designs, has offered our winners three different prizes! Any item of their choosing from the shop. The average value of these pieces is $100! Desert Rogue Designs makes awesome leather belts with all kinds of neat pockets on them. 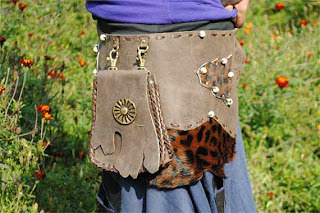 If you're a Rennie, Larper, Burner, artist or just someone who needs a couple of extra pockets (with some sweet style thrown in), these belts are the ones for you. I love being able to support creative, fun individual and businesses! This is a photo of the one they sent me, Visionary Bri. I love the leaf-look of the pockets. When I got the belt, a pleasant surprise awaited me. to keep your goods extra secure. The leather is thick and very sturdy. 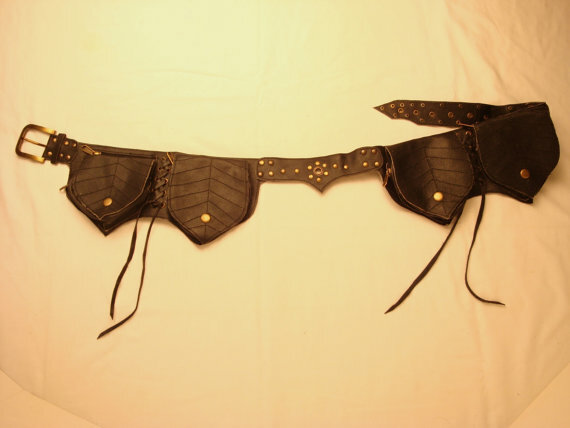 The entire belt is incredibly well-made. I am very impressed! For the colorful, there's this wonderful green and blue belt. The pouches are big enough to carry a wallet, a cell phone, a compact and lipstick or a travel size pack of tissues. Great for keeping all your necessities with you, no matter where you are! Maybe you'd like something a little more urban primitive. Great for Burners, Pennsic, or your local summer fest. I could see this one being worn very smartly with a kilt! to keep your cash and credit cards safe! so enter to one one for yourself or a friend, today! All entries for the giveaway are voluntary. Must be 18 or older and US resident to participate. By entering this giveaway, I understand this is a marketing promotion. I also understand that my email address may be used for marketing promotions in the future by Visionary Bri and / or this giveaway's sponsor. I am aware that I can unsubscribe from marketing emails at any time.